Sony have been dropping so many bombs at tonight’s E3 conference that they might have to register as a PMC, but one of the biggest is easily this: Shenmue 3 is on Kickstarter. 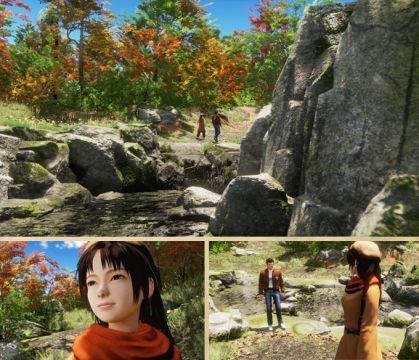 Shenmue 3, the sequel that nobody ever thought would be made, is seeking $2 million USD on Kickstarter. If reached, we’ll get the game on both PlayStation 4 and PC. It’s being built in the Unreal 4 engine, and $29 will net you a digital copy of the game. According to Yu Suzuki – who’s returning as director and producer – people have been stopped asking him when Shenmue 3 is going to be made, and have instead started asking why the hell it isn’t on Kickstarter. Tonight, he’s answered that call by putting it on Kickstarter. Shenmue is a series that got its start on the Dreamcast. Players took the role of Ryo Hazuki, a young man searching for his father’s killer, in a gargantuan open-world adventure. It’s one of the games that has the dubious claim of inventing quick-time events, yes, but it’s also a game that had you wandering a large world, taking on side-quests, playing mini-games, getting into fights, and buying capsule toys. And also going around bars and asking for sailors. And driving a forklift truck. Unlike most open-world games, time of day mattered, time passing mattered, and you actually needed to do things like sleep; it was a world you inhabited rather than just aimlessly wandered like a quest-solving ghost. Also, much as this is the third part in a lengthy trilogy, the Kickstarter claims that it’ll still manage to draw in newcomers. $2 million will get the game made, although obviously, there are stretch goals. $2.5 million will add in Shenmue 1 and Shenmue 2 cinema shorts, while $2.6 million to $2.9 million will add subtitles for German, French, Spanish, and Italian. $3.2 million adds a rapport system, $3.5 million adds a skill tree system, and $4 million expands Baisha Village and chucks in five minigames. On the one hand, this is a seriously hefty financial request – $2 million is not a small amount of money for a Kickstarter. I mean, Bloodstained is an absolute outlier as the highest-funded game on the service, and that managed about $4 million. On the other hand, it’s one of the most demanded games of all time, and it’s already sat on $250,000 with 2000 backers after about ten minutes (although that keeps going up and down, so who knows what it’s really on). Hell, it’s broken Kickstarter three times since I started writing this story. Go and have a look at the Kickstarter over here.